When you hear a filmmaker is "one of the greats" or an "important contributor" to a movement jumping into their work can be intimidating. It becomes something that as a fan of cinema you are required to see. In order to better understand the history of film you must watch certain ones and have a specific reaction to them. That's not too far removed from homework and counter to all the reasons I fell in love with movies in the first place. I started watching films as escapism but eventually my appetite could not be satiated by simple popcorn fare. I wandered towards the back of the video store. Having devoured the new release wall and staff picks I needed something a little more off the beaten path to satisfy my growing obsession. Starting with directors whose recent films I enjoyed, I went backwards through their filmography's and eventually ended up on the films that inspired them to pick up camera's. I made it homework. Instead of happening across interesting box art I made lists and prioritized my viewing as if it were a job. In my 40th year I can feel the pendulum swinging back the other way. Tired of homework I'm really looking for honest escapism. I seem to gravitate towards films that are entertaining without being insulting. Unfortunately most of the films playing at the multiplex don't do it for me these days but the ever growing VOD market has reintroduced me to the joy of wandering around looking for what to watch next. I find myself looking through thumbnails instead of box art but the mission is the same. If you are familiar with the name Agnes Varda chances are you've seen her double feature JANE B. PAR AGNES V. and KUNG-FU MASTER! “I’ll look at you, but not at the camera. 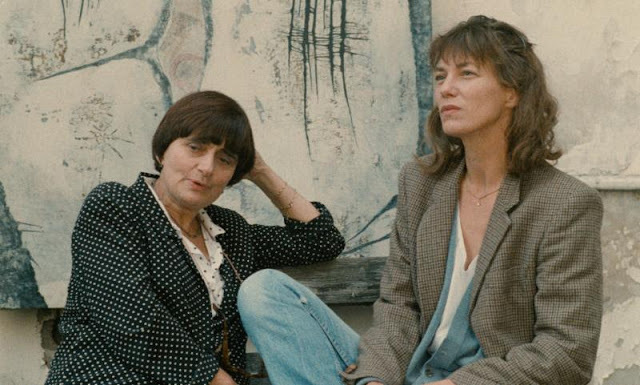 It could be a trap”, whispers Jane Birkin shyly into Agnès Varda’s ear at the start of JANE B. PAR AGNES V. The director of CLEO FROM 5 TO 7 and VAGABOND once again paints a portrait of a woman, this time in a marvelously Expressionistic way. “ It’s like an imaginary bio-pic,” says Varda. Jane, of course, is the famed singer (“ Je t’aime … Moi non plus ”), actress (BLOW UP), fashion icon (the Hermes Birkin bag) and longtime muse to Serge Gainsbourg. As Varda implies, JANE B. PAR AGNÈS V. abandons the traditional bio-pic format, favoring instead a freewheeling mix of gorgeous and unexpected fantasy sequences. In each, Jane inhabits a new character, playing a cat & mouse game with Varda as they explore the role of the Muse and the Artist, all the while showcasing the multifaceted nature of Birkin’s talent. “ I’d like to be filmed as if I were transparent, anonymous, like everyone else, ” says Birkin. But her wish to be a “ famous nobody ” is impossible to achieve; Birkin is simply too magnificent, too mesmerizing. Here, Varda’s signature mix of aesthetic innovation and generosity of emotion results in a surreal and captivating essay on Art, Fame, Love, Children and Staircases. For its first-ever U.S. theatrical release the film has been newly-restored from the original 35mm camera negative, overseen by director Varda herself. A lovely, bittersweet companion to JANE B. PAR AGNÈS V. from director Agnes Varda and star/muse Jane Birkin, KUNG-FU MASTER has nothing to do with martial arts – the film’s title comes from an arcade video game played obsessively in the film by a teenaged boy, Julien. Birkin delivers one of her finest performances as a lonely 40-year old woman who finds herself shattering taboos by falling in love with the 14-year old Julien – but is it romance, or a desperate attempt to turn back time in the face of middle age? The wonderfully compelling thing about this film is that it doesn't seem to judge its characters for their actions. It neither condemns nor commends the characters, we are allowed to witness everything they go through and draw our own conclusions. While I have a difficult time giving into the conceit of the film the performances on display are so strong I'm not terribly concerned with believability. It was a pleasure to spend a couple hours in the capable hands of a master filmmaker and her muse. More than enough has been written about the importance of the French New Wave and considering my lack of a unique perspective on the period it would be redundant for me to pontificate on it. The only reason I bring it up at all is to dissuade those who would lump these films in with the "homework" movies they've been avoiding for years. JANE B. PAR AGNES V. and KUNG-FU MASTER! are both currently available on VOD and Blu-Ray.